Bread Black of Castelvetrano can consume food and meals as normally gets with all the other loaves, it also accompanies very well with meats, cheeses and Nocellara Olives canteen. One way typical and ancient degustarlo for condirlo however, is still warm, recipe dialect known as "Lu pani cunsatu" (The Bread seasoned). Take the black bread still warm, just sfornato, and divide it into two or slices, condirlo Oilo extra virgin olive Nocellara del Belice , salt, oregano, tomato dry or fresh cut slices, cheese pecorino first salt or even with the Vastedda del Belice, salted anchovies and a clove of garlic cut into small pieces. Superfluous to say which is a delicacy. 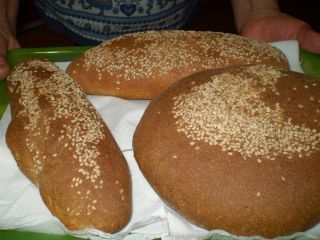 If you want to know more, visit the page The Black Bread of Castelvetrano.